The share of first-time buyers purchasing homes in June 2016 was the highest recorded since July 2012: 33 percent. 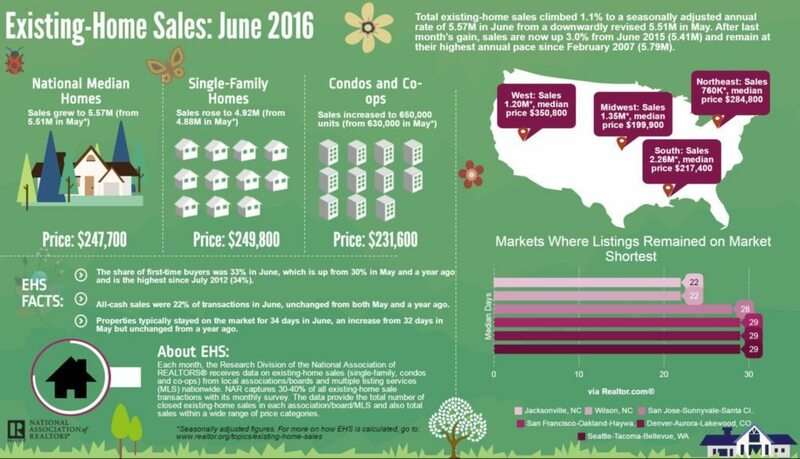 Total existing-home sales were up 1.1 percent in June, to a seasonally adjusted annual rate (SAAR) of 5.57 million. There’s finally some good news on the first-time homebuyer front: The share of first-time buyers purchasing homes in June 2016 was the highest recorded since July 2012, according to the National Association of Realtors’ Existing-Home Sales report. In June, 33 percent of all home buyers were first-time buyers. This is up from 30 percent in May 2016 and 30 percent in June 2016. On average, for the first six months of the year, first-time buyers represented an average of 31 percent of all buyers. This is a slight increase from the 2015 average: 30 percent. “The modest bump in June sales to first-time buyers can be attributed to mortgage rates near all-time lows and perhaps a hopeful indication that more affordable, lower-priced homes are beginning to make their way onto the market,” said Lawrence Yun, NAR’s chief economist, in a statement. In June, 33 percent of all home buyers were first-time buyers. Total existing-home sales were up 1.1 percent in June, to a seasonally adjusted annual rate (SAAR) of 5.57 million. In May, the SAAR was 5.51 million. Last June, the SAAR was 5.41 million. This indicates the highest annual pace since February 2007, when the SAAR was 5.79 million. The median existing-home price in June was $247,700; this is up 4.8 percent from June 2015, when the median price was $236,300. This is the 52nd consecutive moth of year-over-year price gains. “Existing sales rose again last month as more traditional buyers and fewer investors were able to close on a home despite many competitive areas with unrelenting supply and demand imbalances,” said Yun. “Sustained job growth as well as this year’s descent in mortgage rates is undoubtedly driving the appetite for home purchases. “Looking ahead, it’s unclear if this current sales pace can further accelerate as record high stock prices, near-record low mortgage rates and solid job gains face off against a dearth of homes available for sale and lofty home prices that keep advancing,” he added. Low housing inventory still remains an issue — total inventory at the end of June showed 2.12 million existing homes available for sale; this is 0.9 percent lower than May 2016 and 5.8 percent lower than June 2015. Unsold inventory at the current sales price is at a 4.6-month supply (down from 4.7 months in May). In June, properties stayed on the market for about 34 days — up from 32 days in May, but the same amount of time as June 2015. Short sales were on the market a median of 146 days, foreclosures for a median of 49 days, and non-distressed properties for a median of 30 days. Of all homes sold in June, 48 percent were on the market for less than a month. Distressed sales (foreclosures and short sales) represented 6 percent of sales in June 2016, down from 8 percent in June 2015 and unchanged from May. Foreclosures represented 4 percent of sales and short sales, 2 percent. On average, foreclosures sold for 11 percent below market value in June (12 percent in May), and short sales sold for 18 percent below market value (11 percent in May). What was sold and where? And where were people buying these homes? In the Northeast, existing-home sales declined to an annual rate of 760,000, down 1.3 percent month-over-month but up 5.6 percent year-over-year. Median price: $284,800. In the Midwest, existing-home sales increased to an annual rate of 1.35 million, up 3.8 percent month-over-month and up 4.7 percent year-over-year. Median price: $199,900. In the South, existing-home sales were unchanged from an annual rate of 2.26 million, the same as last month but up 3.2 percent year-over-year. Median price: $217,400. In the West, existing-home sales declined to an annual rate of 1.20 million, up 1.7 percent month-over-month but down 0.8 percent year-over-year. Median price: $350,800. Existing-home sales are based on transaction closings from MLSs and include single-family homes, townhomes, condominiums and co-ops. Seasonally adjusted annual rates are used in reporting monthly data to help accommodate for seasonal variation; the annual rate for any given month represents what the total number of actual sales for a year would be if the pace for that month were maintained for a whole year.